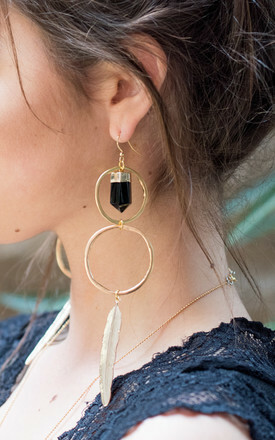 These beautiful limited edition feather earrings encompass a black onyx crystal point draped on a hammered gold hoop with a gold plated feather. These earrings feature a gold plated hoop with a diameter of 40mm. The length of earring from the top of the ear wire is 35mm. These beautiful limited edition feather earrings encompass a rose quartz crystal point draped on a hammered gold hoop with a gold plated feather. Rose quartz is known as the stone of unconditional love and friendship. It opens up the heart, increasing self-love, healing, and inner peace, establishing greater compassion, and harmony in oneself and relationships. The length of earring from the top of the ear wire is 45mm.